GMers and SMers are scattered through the book, so the first step to solving the Cube mini-puzzle is to trace and count them all. Mers appear on every page except P2 and P44, sometimes as many as 11 of them. The table below lists the number of SMers and GMers on each page. Some of them are well camoflagued so it requires careful, time-consuming work to find them all. Solving the Merlin Mystery is sometimes more of a trial than an enjoyable puzzle, and the worst is yet to come. In P18,S38, a Red Baron plane (which is the linking object back to the Cube) is linked to a book of Mer symbols and having its pages half turned over. The book is shown more clearly on P4,S16. There are silver symbols on the left page and gold symbols on the right page. The idea is that the Mers tell you to turn to different pages in MM. For every SMer on a page, turn one double page to the left. For every GMer on a page, turn one double page to the right. So, let’s add up all the Mers and see what pages we’re told to turn to. In the table below, a negative number means “turns to the left”, a positive number means “turn to the right”. It’s clear we’re on the right track since every page is represented once and once only. There’s also a nice symmetry between P4 and P42 where you end up staying on the same page after counting Mers. When solving the Cone puzzle in part 5, it became clear that something important was missing. The number of hats and alchemy symbols created parts of a sequence, but didn’t match up didn’t match up on every page. The Cube mini-puzzle fills the gap by telling us to turn to different pages of the book. The difficulty is working out the order to do things in. In the line of solids on P4 and in the coloured sliding block puzzle, the Cone precedes the Cube. This suggests drawings lines from hats to alchemy symbols on each page and THEN turning to a new page. Doing this sort of works for the first few pages, but the pattern soon breaks down. Instead, the hats on the starting page (Pyramid puzzle) mark starting squares for drawing lines. The Cube puzzle step of turning to a new page is performed next. 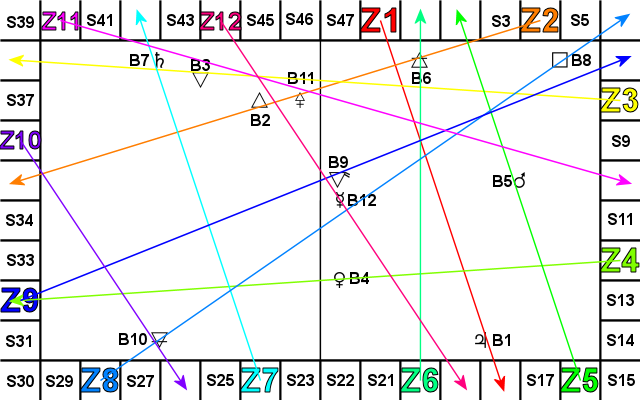 Then lines are drawn from the starting squares through the Alchemy symbols on the new page according to the Cone puzzle. The only hint I have found for this reversal is at the bottom right of P10. Here, the Red Baron, linked to a Cube, is shooting a line of bullets from one border square and hitting a Spitfire on another border square. The Cube comes before the Cone under this interpretation. It’s a stretch in my eyes but, in the end, it’s the only way to make the puzzle work. The list of the “B” numbers (spitfire order) for the alchemy symbols on each end page. 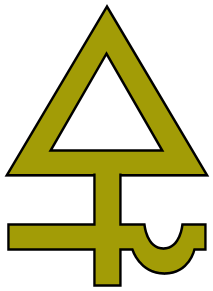 Zodiac point Z1 always points towards Alchemy Symbol B1, Z2 to B2, etc. This is it. We have a sequence of 75 starting Zodiac squares going round the border in clockwise order from page to page through the book. And we have a sequence of target Alchemy symbols appearing in order on a different set of pages. The end goal is to identify 75 objects on the border squares. The idea is to extend the lines pointing to the alchemy symbols until they hit a new border square. If you’re struggling to work out how draw lines from one page to another “in 3D”, as described in the official solution, it’s important to realise you don’t need to. The border squares are in the same place on every page. You just need to know which squares to start at. Then you turn to the page where the correct Alchemy symbols are and drawn a line from the starting square, through the alchemy symbol and out to a new border square. This is the most lengthy part of the puzzle and I’m sorry but I’m not going to write out all 75 end squares. Below is a table of the first 12 to get you started. And here’s a colourfully confusing image show all the first 12 lines. Each Zodiac square and the line coming from it are drawn in a different colour. Lines pass through the first 12 Alchemy symbols, which I’ve drawn in roughly the correct positions. Z1 goes through B1, Z2 through B2, etc. The PDF crib sheet shows all 12 Alchemy symbols with their numbers for easy reference. It would be tempting to take the objects contained in these 12 end squares, or 75 if you do them all, and try to find some pattern or meaning. It quickly becomes clear, however, that very few of the end squares contain a definite object. The conclusion is that we still haven’t found the final solution squares. Given that there are still 4 more mini-puzzles to solve, this is not surprising. Though it is a little disheartening after all that work. Part 7 covers the Sphere mini-puzzle which relates to the gold and silver Cadency symbols. If you’ve followed the solution this far, the next step should not be too hard to solve for yourself, though counting all the different Cadency symbols requires even more care than the gold and silver Mers. Give it a go before reading on.